WASHINGTON — An appropriations bill approved by a Senate committee July 27 would restore funding for several NASA Earth science missions slated for termination by the administration as well as a satellite servicing program. The bill and accompanying report, released after the markup, reveal significant differences between the Senate and both their House counterparts as well as the original White House request in several areas, including science and space technology. The Senate bill provides $1.921 billion for NASA’s Earth science program, identical to what it received in fiscal year 2017. The White House’s proposal sought a cut of $167 million in the program, while the House deepened that cut by an additional $50 million. The administration’s proposal sought to cancel four missions under development or in operation: the Plankton, Aerosol, Cloud, ocean Ecosystem (PACE) satellite, the Climate Absolute Radiance and Refractivity Observatory (CLARREO) Pathfinder and the Orbiting Carbon Observatory (OCO) 3 instruments for the International Space Station, and Earth-viewing instruments on the Deep Space Climate Observatory (DSCOVR). All four are specifically funded in the Senate report. The Senate also supported a fifth project slated for termination, the Radiation Budget Instrument (RBI), with conditions. The Senate report states that NASA must report on whether RBI can be ready for inclusion on the Joint Polar Satellite System (JPSS) 2 spacecraft and stay within budget. If so, NASA can continue working on RBI using reprogrammed funding. While Earth science received a large increase in the Senate bill, planetary science was cut: the Senate bill offers $1.612 billion, versus the administration’s request of $1.93 billion and the House bill’s $2.12 billion. The report includes $660 million for NASA’s Mars exploration program, but unlike the House bill does not specify any funding for planning missions beyond the Mars 2020 rover. As in past years, the Senate bill also does not specify any funding for the Europa Clipper mission or a follow-on lander, which is explicitly mentioned in the House bill at levels higher that the original request. There were few changes in NASA’s astrophysics or heliophysics divisions, or for the James Webb Space Telescope. The Senate report allocated $150 million for the next flagship astrophysics mission, the Wide Field Infrared Survey Telescope (WFIRST), about $25 million above the NASA request. Another major difference between the Senate bill and both the original request and the House bill is in satellite servicing. The administration sought to restructure the Restore-L program, a mission that would refuel the Landsat 7 satellite, into a more generic satellite servicing program that would receive $45 million. The Senate bill, by contrast, provides $130 million for Restore-L, the same amount as it received in 2017. 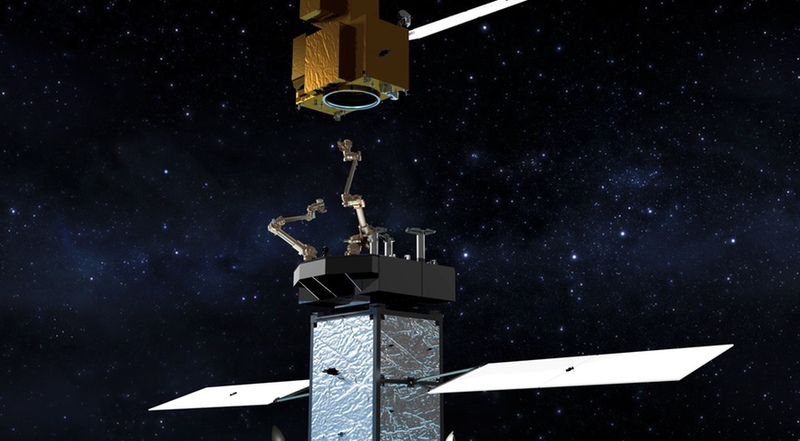 While critics of Restore-L had argued it duplicated a DARPA project for geostationary orbit satellite servicing, the Senate rejected that claim. “By focusing on low-Earth orbiting satellites, it avoids competing against industry and holds the potential to save money by allowing government satellites longer operational life,” the report stated. In other areas, the Senate is more closely aligned with the House. They provide $2.15 billion for the Space Launch System and $1.35 billion for the Orion spacecraft, both above the administration’s request. Both also reject the administration’s proposal to close NASA’s Office of Education, with the Senate offering $100 million, the same as 2017, and the House $90 million. During the debate about the CJS bill by the appropriations committee, Sen. Jeanne Shaheen (D-N.H.), the ranking member of the CJS subcommittee, introduced an amendment to add $6.51 billion to the overall $53.4 billion bill to address areas she felt needed additional funding. Among them, she said in her remarks, was to increase NASA science funding to its 2017 level, an increase of $193 million. The committee rejected the amendment on a 16–15 vote along party lines, with Republicans arguing the additional funding would have exceeded existing spending caps. The CJS bill also funds weather satellite programs at the National Oceanic and Atmospheric Administration. The Senate bill provides $518.5 million for the Geostationary Operational Environmental Satellite R (GOES-R) program and $775.8 million for the JPSS program, matching the administration’s request and the House bill. The Senate, though, restores funding for the Polar Follow-On (PFO) program that supports development of the third and fourth JPSS satellites. The Senate provides $419 million for the program, compared to $150 million in the administration’s request, which sought to restructure the program. The House, raising questions about that restructuring, offered only $50 million for Polar Follow-On. The appropriations committee also approved a transportation and housing and urban development spending bill that includes funding for the Federal Aviation Administration. The bill provides the FAA’s Office of Commercial Space Transportation $21.587 million, $1.76 million above what it received in 2017 and overriding a $1.9 million cut proposed by the administration. The House bill also offered $21.587 million for the office. The Senate report, similar to the House report, directs the FAA to enhance its payload review process to provide companies planning lunar missions “with the security and predictability necessary to support substantial investments.” How such non-traditional commercial space activities, which are not clearly overseen by the FAA or other agencies today, should be regulated is a topic of ongoing debate. The Senate bill also directs the FAA to provide the committee with a report into the June 2015 “catastrophic launch failure by a commercial launch provider,” a reference to the SpaceX Falcon 9 accident on a commercial cargo resupply mission to the International Space Station. That report, which consolidates previous investigations by or for the federal government, would also include a summary for public release. Senate leadership has not indicated when these or other appropriations bills will be take taken up by the full Senate. The House is expected to pass a “minibus” consolidating four appropriations bills, including defense, by July 28, but has not yet taken up the CJS or transportation spending bills. The fiscal year 2018 appropriations process is unlikely to be completed until well after the fiscal year begins Oct. 1, requiring one or more short-term continuing resolutions to fund the government at 2017 levels.